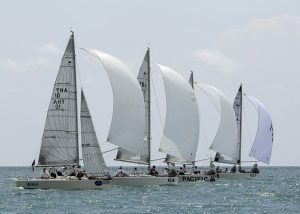 Organisers of the Top of the Gulf Regatta Presented by Ocean Marina have been promoting sailing in the Gulf of Thailand for 13 years and as the award-winning regatta enters it’s 14th edition, held 27th April to 1st May at Ocean Marina Yacht Club, organisers are looking to make the sport more accessible with a demonstration of the all-new S\V14 – a boat designed especially for people with disabilities and built in Thailand. “Top of the Gulf Regatta has always viewed sailing as a sport for all and since year one we have supported youth sailing with Optimist and dinghy classes in the regatta. We will again host the Thailand Optimist National Championships which is the pinnacle of competitive youth sailing in the country, and will this year have a demonstration of the S\V14, a boat built in Thailand and designed especially to be sailed by people with disabilities. 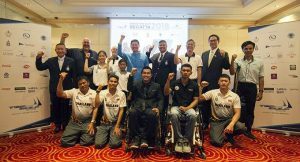 Together with Ocean Marina Yacht Club we are supporting this initiative by Disabled Sailing Thailand and hope to give people with disabilities the opportunity to sail and perhaps in the future the chance to compete in the Paralympics. We believe making the sport more accessible is key to growing sailing in the country,” commented Mr. William Gasson, Co-Chairman of the Top of the Gulf Regatta Organising Committee. Regatta co-founder and host, Ocean Marina Yacht Club is the regatta’s permanent home and as South East Asia’s largest marina facility it provides a convenient and safe base from which to organise a regatta of this size and diversity. Upto 12 classes of boats are expected this year including keelboats and multihulls, one-design Platus competing for the Platu Coronation Cup, a series of dinghy classes, Optimists competing in the Thailand Optimist National Championships, and for the second consecutive year the IOM Class of radio controlled boats. Competitors are coming from as far afield as Australia, Japan and the UK, to name just a few of the more than 25 countries that will be taking part this year. Taking place prior to the Asian Games in Jakarta in August, many countries are sending their national teams and Olympic sailors to compete, including Thailand who will have their full national sailing squad racing in preparation for the regional championships. “We are looking forward to a strong line-up of international and Thai sailors, and expect more than 200 boats and over 600 sailors in total this year. The one-design Platu class has a very high level of sailing talent as do the keelboat and multihull classes with many sailors from Singapore, Hong Kong and beyond coming to compete at the regatta,” added Mr. Gasson.